Locate all the best 2018 Halloween haunted houses in New York at Funtober. 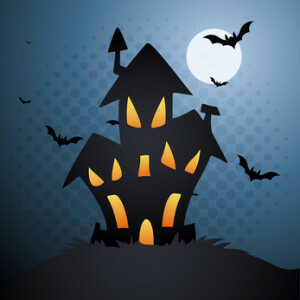 If you are looking for scary fun then we have the dates, hours, and locations for all the haunted houses, haunted trails, scream parks, haunted corn mazes and more fun to terrify you. Get your friends together for a night out at a local New York haunted house. Expect to be frightened with great animatronics, Hollywood set designs, live actors, air blasters and scary costumes. Whether you are in New York City or Buffalo we can get you to a haunt your family will love. Find some local ghost, vampires, goblins, zombies, creatures and maybe a Freddy or Jason or two roaming around your countryside. Their thrilling adventure begins on September 22nd. The Bayville Scream Park delivers with 6 haunted attractions and numerous midway type activities. It sponsors both daytime activities for kids and the scream park at night. The midway has fast food, pizza, and burger vendors. It serves beer and wine. It has an arcade full of carnival games. Having a birthday then Bayville is the place to have a party. The times on Friday and Saturday are from 6 pm until 1 am. All other nights are from 6 pm to 10 pm or 11 pm.. Bayville also has kids not so scary times on the weekends from 11 am to 6 pm. Bayville Scream Park features run Friday and Saturday nights in September and nearly every night in October. Ticket prices vary greatly by number of attractions and combination packages. Please check their web page for full details on prices and schedule. This is one of the most popular haunt attractions in the country. Bayville has over 28,000 Facebook likes. Opening night is October 5th. Blood Manor is a 5000 square foot haunted house consisting of themed room, dark corridors, and a 3D labyrinth all in famed New York City. All new entrance and scenes for shorter lines. It takes about 25 minutes and $35 plus service charge to go through Blood Manor. When done why not dine at Hannibal’s Kitchen. Open every Thursday, Friday, Saturday, and Sunday nights plus some other dates. It is open 7:30 pm until 2:00 am or 1:00 am on Friday and Saturday nights. Check their webpage for other opening and closing dates. Some new attractions include The Crypt, Thunderdome, The Wake, Mayhem, Maggot Invasion, and Hannibal’s Hell. Blood Manor has over 24000 Facebook likes. Opens for the season on October 5th. Attraction theme is based on their Warehouse of Horror Realm attractions. This is a series of walk through horror mazes that will test your sanity. Enjoy between 6:30 pm and 10:30 pm. Open Friday, Saturday and Sunday nights in October. Horrors begin with opening night on September 28th. Chamber of Horrors is located inside Matt Guillano’s Play Like A Pro. This is where fear lives. Lots of mayhem roaming the parking lot. Join Miss Fortune and her cast of crazies. Doors open for all nights at 7 pm. Open every Friday, Saturday and Sunday nights in October plus more nights near Halloween. Check their web page for details. Demons arrive on October 5th to start their season. Individual tickets are $8-12 per person. Both the haunted house and hayride are really good. They run from 7:00 pm until 11:00 pm. Open every Friday and Saturday nights in October. Their haunted hayrides begin opening night on September 29th. Now operating for over 25 years the Double M has terrified thousands. This years attractions are Haunted Hayrides, The Stockyard, Darkwoods Academy, Last Inn, Clown Carnevil, and Schadenfreude Circus. More than enough zombies, demented souls, clowns, and creatures to keep you awake at nights. Attraction is open most Friday, Saturday, and Sunday nights in October plus a couple added dates. See their webpage for details. There are online discounts available. You must reserve a time for this attraction online or call 518-884-9122. Parking is free. An annual local haunted attraction. An outdoor event with lots of actors. Open Friday, Saturday and Sunday nights in October. All kinds of scary fun begins on September 28th. Back again at Youngman Plaza and the former BJ’s. Now in its 16th year Fright World has 5 haunted houses full of many demons from the unknown. Every year the haunts are updated and new ones added. A ticket to get into all five attractions has a $30 price or two attractions for $18. There is an onsite FrightWorld Café that was also remodeled. During October the park is open until 12:30 am on Friday and Saturday nights. Check website for other dates. FrightWorld appears to have lots of fun and frights. The Grindhouse takes you deep into the bayou to meet the creatures inhabiting an old cabin in the muck. Phobiaz puts you face to face with your deepest fears and illusions. The Condemned brings to face to face with a deranged and disfigured family in farm animal masks. All attractions are indoors and are not affected by rain or weather. Fright World has over 38000 Facebook likes. The hayride attractions start running on September 22nd. Headless Horseman has been creating nightmares for over 23 years. This is a popular attraction having been featured on the weather channel and the Today Show. Doors open at 7:00 pm. Get your timed tickets online to save money and time. Attraction has a one mile long haunted hayride, a labyrinth style corn maze, a side show, line actors, 4 food venues, 4 gift shops, and 6 amazing haunted houses. It takes between 2 to 3 hours to see all the attractions. Admission into the midway is free. The Ride and 8 Attraction Tickets are a total of $41.95. This attraction runs every Friday, Saturday, and Sunday nights in October. See webpage for additional dates. Headless Horseman has over 67000 Facebook likes. Opening night is September 29th. Attraction is open from 7 pm to 11 pm on Friday and Saturday or 9:30 pm on other nights. Ticket prices are $28 online. You will love this attraction which has been operating locally for over 41 years. They feature the Haunted Mansion, Fright Trail, and London After Midnight. All for the one ticket price. Open Friday, Saturday, and Sunday nights in October. Check webpage for kid’s nights and events. Sorry folks this haunt attraction has permanently closed. It runs Thursday, Friday, Saturday, and Sunday nights in October. Doors open at 7:30 pm. Tickets are available on Friday and Saturday nights or discounted on other nights. Attraction is a 1/4 mile walk-thru and again for 2018 scenes. Don’t miss the “Undead Zone” or “The Sinister Sewers” attractions. Get your picture taken in the scare chair. This attraction is open every day all year weather permitting. It is at the top of Clifton Hill as part of the popular Niagra Falls tourist attractions. Fear Factory is located directly across from Casino Niagara. Tickets are $13.95-14.95. Expect to get found by lots of Zombie’s at Fear Factory. This Niagara Falls tourist attraction is open generally from 11:00 am to 11:00 pm or 2:00 am. Nightmares Fear Factory has over 41000 Facebook likes. Attraction opens this season on September 22nd. Tickets available to go through all five of their huge new haunted attractions with over 2 miles of frights. . Also explore Trail of Terror, Phobia Haunted House, Terror in the Dark Haunted House, Sanitarium Terror, and House of the Dead. They have 11 attractions. It is open Friday, Saturday and Sunday nights in October plus a couple Thursday nights. Ticket booth opens at 6 pm. Doors close at 11 pm on Friday and Saturday, 10:30 pm on Sunday, or 9:30 pm other nights. Expect it to be very scary. Beyond the limits of fear. Pure Terror has over 29000 Facebook likes. A charity haunt doing good work. Hours are 8 pm until 11 pm. They also have a Friendly Frights for kids that runs for 90 minutes before their adult haunt. Open Friday and Saturday nights on October 19. 20. 26.and 27. They have announced that 2018 will be their final year. The fun begins this year on September 29th. The main attractions for Tagsylvania are Jerkus Circus, Psycho Swamp, and Lecter’s Lair. This place opens every Friday, Saturday and Sunday nights in October. Doors are open from 7 pm to 11 pm. Individual or combo priced tickets available. The season at the haunted barn begins on October 5th. There is a haunted barn and a terrifying corn maze attraction. Admission tickets are $33-35. Attraction is open every Friday, Saturday, and Sunday night in October. The hours are from 7 pm until around 11 pm. Sorry folks due to rainy weather in the local area they will not be opening in 2018. This haunt opens their season on October 5th. Two haunted houses, a wooded trail, and walk through the haunted corn field at The Haunt at Rocky Ledge. It takes about 25 minutes to complete the cornfield scare with a six person group. Parking is free. There is a concession stand at the end of the attraction. If you can still eat. The attraction runs Friday, Saturday, and Sunday nights in October. Friday nights are open from 8 pm until 11 pm. Saturdays are open from 7 pm until 11 pm. Sundays run from 7 pm until 10 pm. The fun this season begins on October 5th. Schmitts Family Farm hosts both daytime and night time fun. Tickets are for the Haunted Mansion attraction and the Haunted Corn Maze. Also experience The Experiment. A combo ticket for all attractions is available. It opens at 7 pm and closes at 12 am on Friday and Saturday nights or 11 pm on other nights. It runs most Thursday, Friday, Saturday, and Sunday nights in October. They are advertised as the largest haunted mansion on Long Island. The season begins September 28th. Attraction features a Haunted Hayride and Haunted House. They are open every Friday, Saturday, and Sunday nights in October. Doors are open from 7 pm until midnight on Friday and Saturday or 10 pm on Sunday. The terror begins with opening night so check web page for details. They feature an Outdoor Trail, Halls of Teror, and Séance Room. Open Friday and Saturday nights in October. Have you experienced one of these haunted houses? Future visitors would be interested in hearing what you thought. Did you have a good time? Was it worth the price? Would you recommend it to our readers? Any suggestions to maximize your experience? I’ll gladly publish what you send me and give you an over the internet hug. If you are the owner or employee of a haunted house on this list, or one I missed and need to add, I would love to have more information about the haunted house, photos, dates/times/hours for 2018. Use the contact form to get in touch and I’ll tell you where to email your answers to these questions.